Bruce Fox, Inc. is the premier custom awards and displayable products supplier serving the promotional products industry. We design and produce meticulously-crafted high-end recognition award solutions, as well as branded displayable products of all kinds. We are renowned for our expertise in the recognition award market. But we are also engaged in a broader range of product applications, including ID/signage, point-of-consumer displays, commemorative gifts & keepsakes, premiums and promotional gifts—nearly anything that can be designed and built. We start with a blank sheet of paper. From there, we design, engineer and manufacture product solutions specific to the themes, cultures and brands of our distributors’ clients. Bruce Fox offers 80 years of experience as an agency-style creative resource, a wide range of capabilities, and a job-shop studio of master craftsmen. So, who is Bruce Fox, Inc.? Bruce Fox is a custom awards and custom displayable products manufacturer; founded by an artisan, now a team of craftspeople. We offer unique agency-style solutions exclusively through independent re-sellers, including promotional products distributors and other third party agencies. We combine elements of the client’s brand, identity, and culture—the very DNA of what makes every organization unique—which are the basic ingredients of our creative work. We are also innovators of our craft, with two Bruce Fox exclusives – Electroforming (Engle) and Cast Urethane (Foxite). We are constantly pushing ourselves to innovate and develop our craft, that’s what defines us as inventive artisans, which is part of our DNA and history. We are craftspeople and artisans with over 75 years of experience and skill in executing superior designs, utilizing a mastery of materials, and fabrication techniques. Do you have a piece of paper and an idea? We can help you design, develop, and produce your fleshed out idea or if it’s just a vague concept- we can help. We have a creative agency approach; so we’re not order-takers that leave you out to dry! Check out our product inspiration gallery, our portfolio, and our What We Make page for more information and ideas. We abide by rigorous standards, precise measurements, and tightly-defined tolerances. But what truly sets us apart is that we genuinely care about what we do. We are not only committed to the high quality of our custom designs and branded items, but we are also committed to excellent customer service, quality products, and community involvement. We are Expression of Brand. Check out our “Expression of Brand” portfolio for inspiration on how custom concepts can be put to work for you. 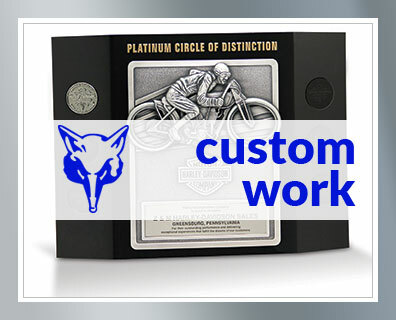 We are the custom awards supplier of choice – reach out to see why for yourself.